A Granger Road, merged into the C&NW in 1968, now part of the Union Pacific RR. Served Council Bluffs, Omaha, Des Moines, St. Joseph, Kansas City and the Southwest. Hub City Heritage maintains a restored F-unit in Oelwein, IA. 6 inch x 6 inch square tin logo sign of the Chicago Great Westerns Corn Belt logo, circa 1917. 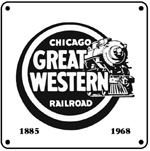 6 inch x 6 inch square tin logo the Chicago Great Western Railroad. 6 inch x 6 inch square tin logo sign of the Chicago Great Western Railroads famous Red Bird passenger train. 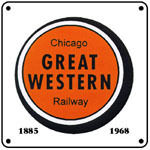 6 inch x 6 inch square tin logo sign of the Chicago Great Western Railroads steam locomotive logo. F-unit diesel of the Chicago Great Western Railroad with various logos used by the CGW over the years. Photo available soon. Same diesel photo as on the mouse pads.